Two weeks back I got invited to the THQ Game Preview Event in Dublin. It was an interesting two days, getting to meet tons of games bloggers and journalists, and getting some cool previews of some upcoming games. 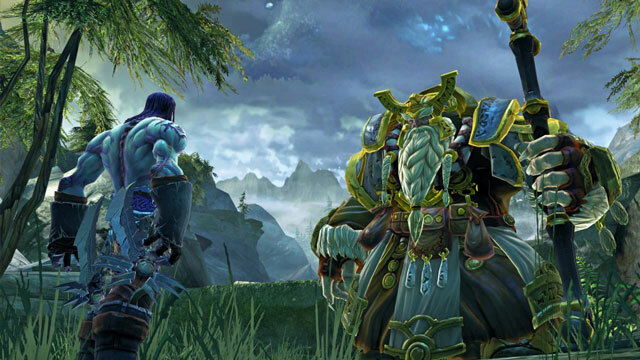 I got to play 2 hours of Darksiders 2, after which I sat down with its lead designer Haydn Dalton. Although I’ve participated in roundtable interviews and press conferences before, this was my first ever one-on-one interview! I was pretty nervous and my questions aren’t as brilliantly formulated as I had hoped, but it was a great first interview. What’s your role on the game? I’m the lead designer on the project. So I obviously help come up with the initial ideas and the structure of the game, and then I oversee the execution of the game. Like how the combat plays out, how the encounters work and how the levels are designed. I get to be involved in a lot of different disciplines on the project; the programmers, the animators, whoever it might be. It’s more overseeing things and making sure things are built to a certain level of quality. So how does the process most of the time work? With what would you start? What do you focus on first? We firstly try to figure out what type of game it is and what type of things we’d like to see. Obviously we try to see what other games in that genre are doing; you need to know your competition and understand what’s working and what’s not working. And then you try and think of “well, how could we be different in that genre? What can we add to that genre?” And you think of all your cool ideas and you come up with a basic plan of how to execute that idea. That’s when you start to think: to do this we need these tools, and we need these people to do it. Usually it’s coming up with a groundwork plan and you build upon that plan and execute that. You usually find out that whatever you write down as an idea, sometimes you find out when you’re doing it in practice and you see, that actually it doesn’t quite work. So sometimes you have to either change the idea or you just have to scrap it entirely. 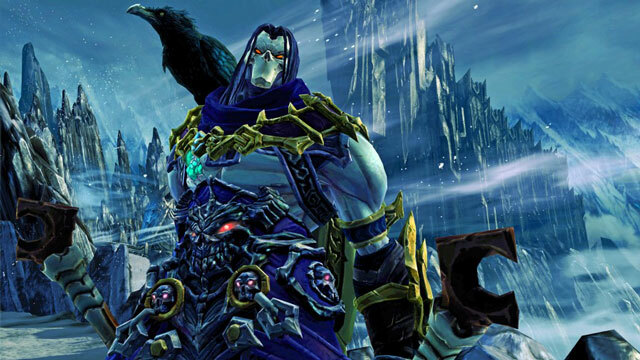 We scrapped a lot of things for Darksiders 2, cause it didn’t quite fit. There was potential there, but we didn’t have time to fix it all. 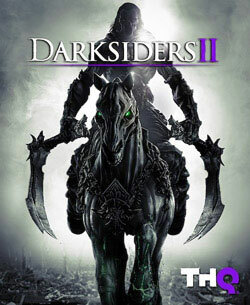 Seeing as this is built on Darksiders 1, how much of those ideas did you already have with the first one? The cool thing we took from Darksiders 1 is a certain level design philosophy that we have there, and we do puzzle design as well. So those two things were the things that were core: we had to have that. We also brought over the pretty frantic combat from the first one. And then we really wanted to look at the things that didn’t make it into the first game. We originally wanted more NPCs in the game for instance, and more items. Kind of like the loot system we now built. The first thing was: let’s get the things we really loved from the first one into this one first, and then let’s layer it with cool new ideas on top of that. So yeah, the loot was a big thing, that took a long time to get the balance right on that. And then all the side quests that we did; we didn’t have any side quests in the previous one. It was all about giving the player a lot more choice. The main characters of the two games have some similarities, but how was it designing a completely new character? The core set of abilities are similar, but there were certain things we wanted to do: we wanted to bring out more agility in Death. We had seen some original sketches that Joe did for Death; during the first project he had done first concepts for all of the four Horsemen. And Death was a lot more athletic and thin and gangly build, whereas War is more broad and stocky. So we thought what would fit a character like Death and it seemed like he was a lot more agile, a lot more nimble. In combat he doesn’t really stand and block, he kind of flips around, he’s a slippery character. That also fed into his traversal sets; he can scamper up walls, scamper across walls, swing on the bars, he’s a lot more about shaping around the environment, being very fluid. It’s the same thing in combat; rather than blocking, he’ll switch out and attack the person from the side. it was really what did we want to do from an actual gameplay point of view and what sort of character did we want to provide the story and bring those two together. What about the third and the fourth Horsemen? We briefly see their silhouettes at the start of this game… do they show up during Darksiders 2? [laughs] You’ll have to play the game to find out. The other two are basically Strife and Fury. Fury is the female Horseman; she’s the one with the whip. Then you have Strife who uses pistols. They definitely have their own character; and we have ideas as to how they’d be like if you ever got to play them. But we can’t really tell right now if they turn up in the game or not. I love the look of Fury, even only her silhouette looks awesome. I want to see more of her! That sounds a bit like Ivy’s [from Soul Calibur]. Yeah, she’s got a sword that segments too. Ours is kind of like an energy whip with metal bits. We saw some of the Realms in the demo; how many different ones are we going to see? Well, you start within that snowy Realm. Then you’ve got the Maker’s Realm, which was the kind of lush one. That’s one of our biggest Realms. Then the third one is another big one, that’s the Kingdom of the Dead; that’s pretty much the same size as the Maker’s world, but it’s all based in the underworld. And then we got an area for Angels, and also an area for Demons. They’re not as big as the Maker’s world and the undead world, but they’re pretty big areas. When I was playing the demo I came across some areas that I couldn’t figure out and access yet. Are they just difficult puzzles or are there some abilities that you only gain later on that allow you to access those? It could be a bit of both. We do have some places that are vey clear challenges or barriers. The way we design the levels usually we have a hub area and spokes, like corridors and sets, that come off it. Now when you keep passing through this central area you become familiar with things within that area. For instance, something that’s considered a gating mechanism might be in that central area; so when you pass by it several times and when you see whatever it might be, like the yellow glowey balls on the walls: you’ve seen it, but you’e not quite sure what it is. Then as you pass through it a few times, you might get the ability down here to clear those things and you always remember: “oh, I passed that thing like two, three times in that area.” So you go back to that area and that usually progresses the story on in a much more advanced way. That’s how we design things for small areas that you at least pass once or twice; it keeps it in the player’s psyche when he’s playing the game. So there are visual gates where you can’t get passed. Then some of the bits are just about trying to read the room: look at where the traversal points are, see if it’s a traversal problem. Or do I need to use an item that I’ve already used before, but now I have to use it in a unique way in this instance. It’s forcing me to make that logical jump; sometimes that’s a little bit hard for players; normally games don’t puzzle the player logically. They’ll do it physically, like: I’ve got to beat this guy down, that’s very clear. But then when you already know how to push a switch in a wall for instance and when you get to part where there’s a switch you can’t get to. You start thinking “well, how am I going to do it” . You realize you’ve got a bomb and think oh I wonder if I can throw that against the switch, will that be pushed in cause of the explosion? And that’s what it is: the player is making that logical step to do the next bit on their own. We try not to do too much hand-holding with that. It’s very fulfilling from a player point of view; you’re sat they’re thinking “what the hell am I supposed to do” and then when you do it, it’s like a little mini moment for yourself, it’s satisfying and you feel all good about yourself. 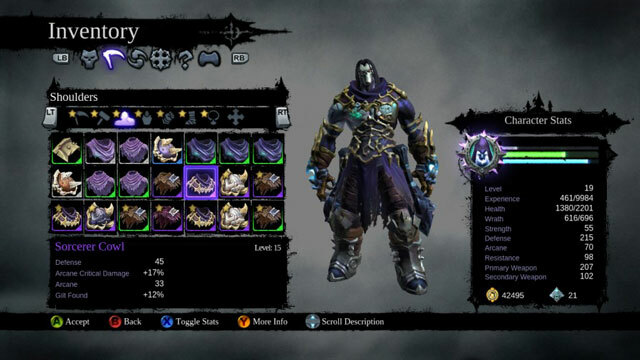 That’s what’s different about Darksiders from an actual action genre type of view; we have a lot of those things in the game, where we just expect a lot more of mental challenges from the player. What type of levels of achievements/trophies can we expect? Usually people talk about the 60/20/20 split: 60% is for the core game, then there’s like 20% for skilled players, which are skilled based achievements, and then there’s 20% which is for the ADD I-need-to-collect-everything type of guy. Ours is more like 70% for the main play through, and then we probably got 20% for the skilled player and then 10% for the guys who really want to collect everything and find every single item. If you just play the game start to end, you’ll get a big chunk of achievements just for playing the game. We know that not many people finish games now, so it’s like at least you’re rewarded and giving them a little push to keep playing on. I think it’s a little deceiving; at the start you just think “oh, it’s just a simple action game”. And then you start seeing the loot, and you start to realize how deep that system is. And you’re like “hang on, I have to start managing all this stuff”. Then you really got to start thinking “what’s my thing, what am I trying to focus on”; do I focus on skills, do I focus on magic? 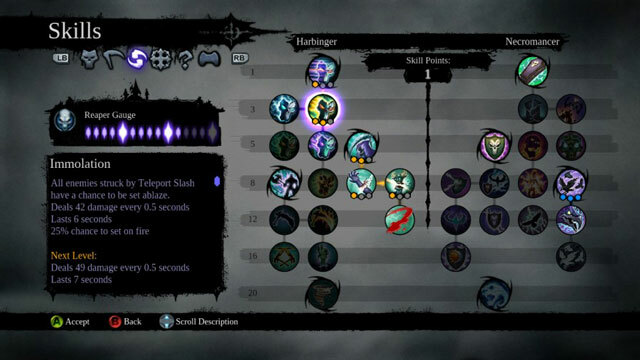 And then you start looking at the skill tree ; and then you go “well, okay, my thing is strength, I’ll start looking at Harbinger stuff, which is based on melee combat”. And maybe my skills and weapons should feed into that as well. So it’s all about these little choices; the player can choose to invest as much or as little time he wants in it. We definitely think if you invest time in it, the character will definitely be more tailored to the way you play.